The Calgary Stampede is pleased to announce the artist who has been chosen to create the historic 2012 Centennial Artwork and Poster. Harley Brown is one of the most respected and recognized artists in the world. Brown, a native Albertan who now resides in Tucson, Arizona, is a western painter and sculptor of figures and domestic animals. It’s believed the poster, created from Brown’s original artwork will be one of the most sought after posters in Stampede history and will be seen in every corner of the earth. His father was an amateur artist who encouraged his young son from age seven to pursue art. After graduation from high school, young Brown began doing department store window displays for an impressive $150 a month. He then attended the Alberta College of Art and later the Camberwell School of Art in London, England. 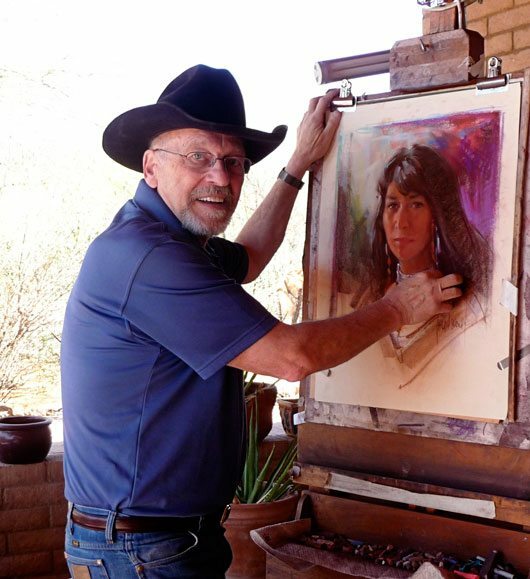 He has received numerous awards and gold medals for his art and is an honoured member of both the Cowboy Artists of America and the Prix De West. Many factors were considered when choosing the artist to commemorate the Calgary Stampede’s Centennial. The works of several well-known artists were also reviewed. Ultimately, Brown was selected to create the art which will represent the 2012 Calgary Stampede to not only in Calgary, but around the world. In anticipation of extraordinary interest, the original artwork will be revealed at an unprecedented unveiling on Wednesday, July 6 and auctioned at the Western Art Auction Thursday, July 14. Western art has been a component of the Stampede from the very beginning – the first Stampede poster in 1912 featured art by Charlie Russell. Since the early 1980s, the Stampede has included a live auction of the best in contemporary and historical western art.